Why the world’s best airport selected Steerpath? Singapore Changi Airport is one of the Asia’s leading hubs and the sixth busiest airport in the world for international traffic. It served more than 62 million passengers in 2017 and connects to over 380 cities in more than 90 countries around the globe. The 4 interconnected terminals include over 1 million square meters of floor area combined. Since opening in 1981, Changi Airport has been one of the world’s most consistently awarded airports. With over 540 international accolades under its belt, it was named the Best Airport in the World for the 6th consecutive year by Skytrax in 2018. Changi Airport Group (CAG) is the operator of the Changi Airport. Superior passenger experience and innovations are at the heart of its continuous development for being the leading airport in the world. Digital services with increased situational awareness and personalisation are one of the enablers for this. 1. CAG has multiple internal and external stakeholders that require up-to-date map and location information. Existing solutions for passenger services, operational and maintenance use cases are point solutions and managed by individual business units. 2. Smooth passenger flow and world’s leading passenger experience are trademarks of Changi airport. Continuous increase in the number of passengers creates challenges for providing personalised information to keep the passenger journey at best possible level. 3. 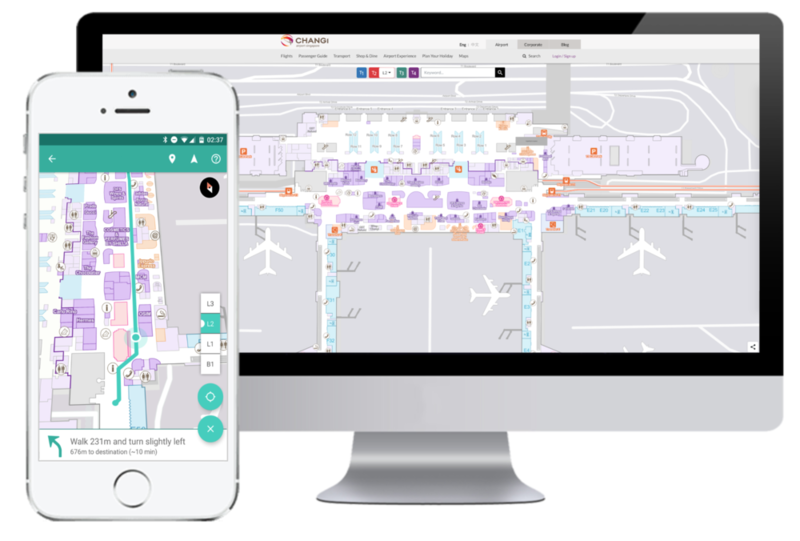 Many different solutions and use cases requiring reliable location and map information inside the vast terminal buildings. Having a unified, reliable, secure and robust infrastructure for these was required. Steerpath integrated with existing data sources such as CAD master plans for structural data, as well as with CMS systems such as Adobe Experience Manager to provide a complete, self-updating map data source that can be used by CAG and their partners in solutions benefitting from map and location data. Automated and process driven map management solution both removed duplicate work required to keep the map data up-to-date in different systems, but also improved the overall quality of the map data. One platform and APIs to manage and use location data for all use cases. Steerpath provided CAG with a secure, robust and maintenance free positioning infrastructure that did not require any changes to network or other IT systems. One infrastructure that is able to cater for the needs of mobile apps, professional solutions and asset/personnel locationing.